"I have nothing but great things to say about the providers"
" I have been going to them for about 15 years and now bring my toddler and husband there"
"The staff has never been anything but kind and helpful"
"On time , professional, courteous, great service great docs"
"Short wait times, friendly staff, and great doctors"
"I would highly recommend Dr. Mata as a family physician!!" "Excellent provider. Takes the time to listen and provide the best recommendations." "One of my favorite doctors yet." 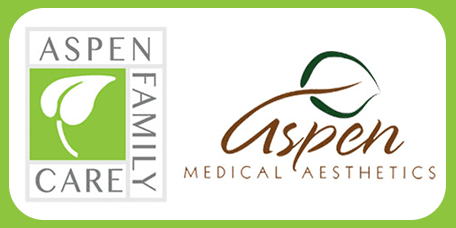 Patient health is the priority at Aspen Family Care & Aspen Medical Aesthetics, located in Highlands Ranch, Colorado. Established in 1997, our mission is to collaborate with patients to provide the highest quality healthcare, while maintaining a focus on wellness, prevention of illness, communication, and education. Providing preventive care in addition to acute and chronic injury and illness care for infants, children, adolescents, and adults, Aspen Family Care utilizes the latest medical technology and knowledge for accurate diagnosis and treatment, drawing from the top specialists in Colorado and throughout the US, when coordinated care is required. And when it comes to optimal health, beauty, and wellness, many of the unwanted effects to our skin can be diminished or prevented with a good comprehensive skin care program. For other issues, often a series of treatments can change one’s appearance in a positive way. Do you have something about yourself that has always bothered you and you are ready to work on it? With new advancements in aesthetics, it just may be able to be treated. At Aspen Family Care & Aspen Medical Aesthetics, we have all of your healthcare needs covered. Call us today to schedule a consultation.